Weekly Flop: RPT Kiev Evacuated, Ivey’s Golf Bet, Poker Tournaments Not Profitable? 150 players at the Russian Poker Tour’s Kiev event were locked indoors, then finally evacuated due to the deadly riots in the Ukraine… On a lighter note, Phil Ivey recently discussed an amazing golf prop bet where he turned $1k into $200k… Deadspin wrote a disparaging article on tournaments that got the poker world’s attention. Here’s an in-depth look at these stories in the Weekly Flop. One of the biggest international news stories lately is the bloody riots that erupted in the Ukrainian capital of Kiev. Nearly 80 policemen and protestors (mostly the latter) have been confirmed dead and hundreds more were injured in clashes that broke out over anti-protest laws. And in the midst of all this, a poker tournament was taking place. Some people questioned why the RPT still chose to hold this tourney. Prior to the event, RPT organizers issued a statement that “the situation in Kiev is getting better and there are no reasons to worry for the guests and participants of the RPT.” Obviously this wasn’t the case and running the Kiev tournament was a big mistake. But at least those in charge did a good job of keeping everybody indoors until things settled down. Phil Ivey hasn’t exactly been a big fan of doing interviews throughout his career. But when the 9-time WSOP champion does do one, he’s always got plenty of interesting stories. He certainly didn’t disappoint in a recent interview with PokerCast. One of the subjects that he covered was a golf prop bet with WSOP bracelet winner Joe Cassidy. 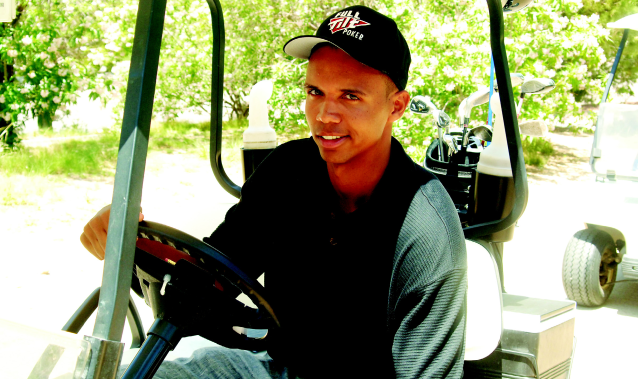 Ivey took 200-to-1 odds on if he could hit a fairly long shot. As Ivey put it, he basically felt like he was “just giving Cassidy $1k.” But amazingly, he made the shot and earned $200,000 off the bet. Aside from this, the 38-year-old also gave a little glimpse into the hush-hush Macau high stakes action. Many poker pros dream of playing in these games because of the Asian whales. But Ivey said that a lot of the businessmen are getting better and his edge has gotten smaller. He also advised that any pro who wants to get in the big Macau games simply needs to hang out in the card rooms there more. This is the point that a recent Deadspin.com article attempts to make about live tournaments through the use of Hendonmob stats and an odd reference to Chris Moorman’s online ROI. The Deadspin piece is pretty well written and cites lots of stats/examples in coming to the conclusion that most US-based pros struggle to make an annual salary of $60k through live tourneys. One decent point is how few big weekly tournaments there are in Las Vegas for pros to capitalize off their positive ROI’s. Just to nitpick the article, though, many of the better pros don’t just stay on US soil. They travel around the world to wherever the biggest events are. So essentially limiting players to Vegas weekly tournaments and the WSOP is a stretch. However, we get the point: the average skilled player will have an easier time earning a living through live cash games. Home » Rakeback News » Weekly Flop: RPT Kiev Evacuated, Ivey’s Golf Bet, Poker Tournaments Not Profitable?